The Southern Utah University (SUU) Percussion Ensemble presents its fall concert on Monday, November 21, 2016 at 7:30 pm in the Thorley Recital Hall. Admission is free and the performance is open to the public. 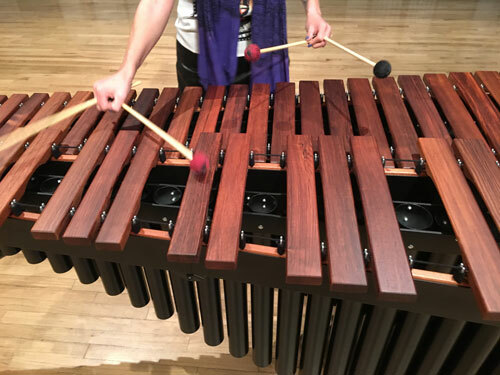 The SUU Percussion Ensemble, under the direction of Dr. Lynn Vartan, Director of Percussion at SUU, perform historically significant works for percussion, contemporary percussion literature, novelty percussion and traditional non-western percussion music. The ensemble is comprised of both music majors and non-majors and welcomes students with a variety of experience. Music for this program includes some exciting and challenging percussion compositions. Stool Pigeon by Julia Davila is an exciting piece played entirely on bar stools. Rocket Summer by Dan Moore is a great play on Martian science fiction movie scores. The tour de force of the evening’s program will be Pyroclastic Steam by Dave Hall. Dr. Vartan said, “Pyroclastic Steam is really cool and big and ambitious!” She is very excited to have her Percussion Ensemble perform such a challenging piece.